Your beauty is captivating, your charm is hypnotic. Never let me go. This lavish arrangement of Roses, Alstroemeria, Scabiosa, Italian Ruscus and premium greens is designed in a full, sweeping design and comes delivered in a beautiful glass vase. 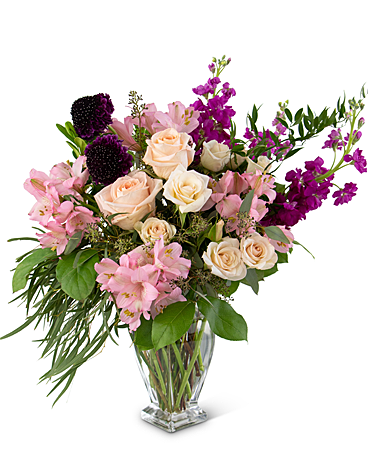 The Captivated by You arrangement is a true testament of your passion and love. Occasionally, substitutions may be necessary to create your bouquet due to the availability of certain flowers in various parts of the country. Care is taken to maintain the style, theme and color scheme of the arrangement, using flowers of equal value. Additionally, the substitution of certain keepsake items may be necessary due to increased demand, especially during major holidays. In single-flower arrangements, such as an all rose bouquet, or lillies, we will make every attempt to match the flower type, but may substitute with another color.